Level 1 School of the Bible will be about assisting you in the disciplined study of Scriptural truth and to encourage you as you express truth through artistic creativity — learning truth and translating truth into creative expression. Upon successful completion of the course, you'll receive a certificate of completion. Click Here for details about Level 1 School of the Bible. This course is to be completed within one year - from January 10th - October 24th. If you desire to register for both DFH Level 3 and Level 1 School of the Bible together, CLICK HERE. 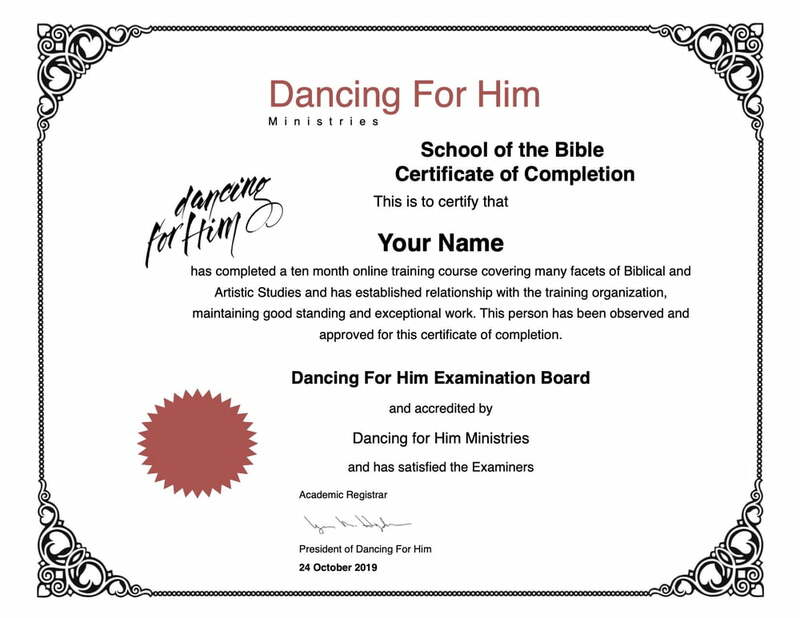 Upon successful completion of Level 1 School of the Bible, you’ll receive a Dancing For Him Continuing Education in Biblical Studies Certificate. You are required to be a graduate of the DFH Level 2 before enrolling into the Level 1 Bible School. Tuition is due on or before December 31st. On or around January 10th, after you are fully registered, we will begin a folder for you and keep track of your progress and send you the Moodle (assignment/grading system) access information.